Post Graduate Resident Medical Officer - MS/MD/DNB degree or Diploma from recognized university in the concerned specialty. Candidates who have acquired the degree/diploma during 2012 or thereafter only are eligible. The candidates having Diploma must possess minimum 2 years of Post diploma experience in the specialty concerned. Resident Medical Officer - MBBS from recognized university with one year internship from recognized institution. Post Graduate Resident Medical Officer - Consolidated monthly pay - Rs.60,000/- for the 1st year, Rs.62,000/- for the 2nd year and Rs.64,000/- for the 3rd year. 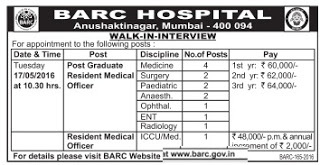 How to Apply: Interested candidates may attend the interview along with one set of attested Xerox copies as well as original certificates of date of birth, educational qualification (Class X, XII, MBBS and Post Graduate Degree - year wise Mark sheet, Degree, Passing and Internship completion certificate etc. ), registration and experience certificate, One passport size self photograph at 1st floor Conference Room, BARC Hospital, Anushaktinagar, Mumbai - 400094.